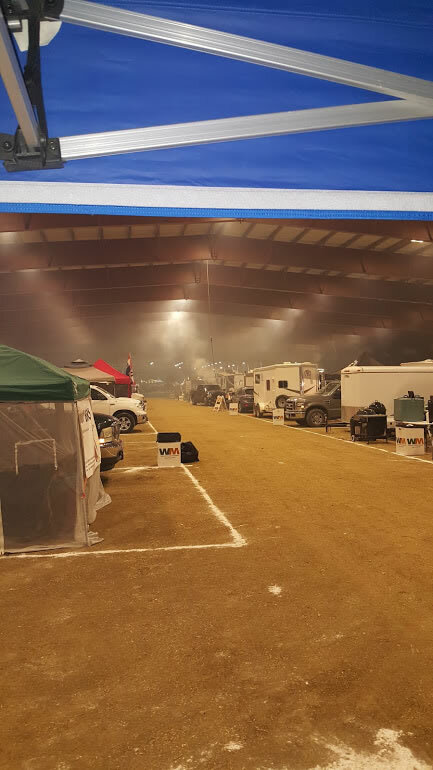 My journey as part of Rad Fondo BBQ has been interesting to say the least. 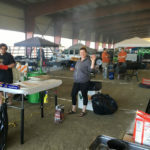 I started as Mike’s assistant cleaning and shuttling turn in boxes at an Ontario backyard competition in September (2015). 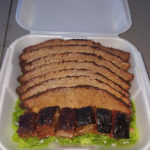 Fast forward a month and he tells me he has no one to cook the brisket for an upcoming KCBS BBQ competition, I am dying to cook anything so I say yes not understanding what that meant. I had no idea brisket was such a complicated meat and that naivety helped make the path more enjoyable. I do know my pattern is to obsess about whatever I am doing and I believed with a lot of research and practice I could become a good brisket cook. 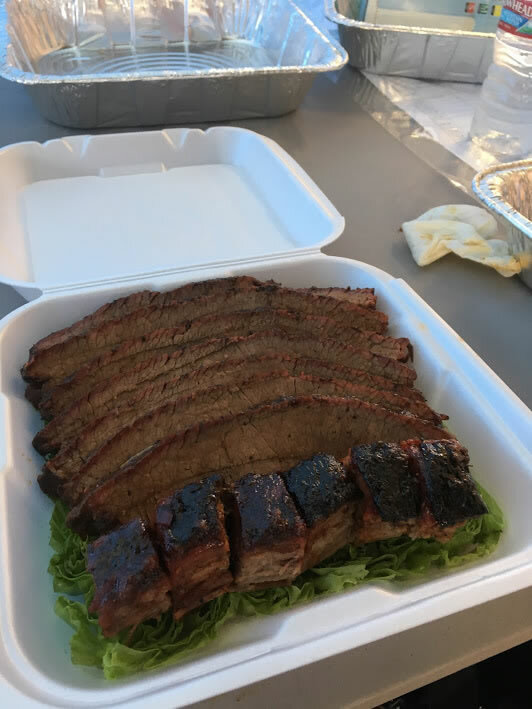 Over the next month I started searching the web and youtube for anything on competition brisket and tried to apply some of the tips I had gleaned. 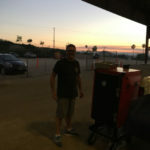 I practice cooked a few briskets and then we headed to Indio for our first competition together in November of 2015. I won’t bore you again with the details as I have already chronicled that fiasco (click here if you missed it). For the next few comps I continued to struggle with trusting my processes but as I gained experience I started to refine my flavor profiles and techniques. 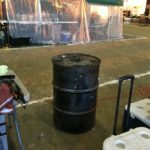 Fast forward to June, 2016 and we entered the Horse Town Brew N Que Festival at the Norco Equestrian Center. I typically try and head out to the comps with Mike, so I can help set up but this day I had to work late and ended up in the 91E juggernaut in late afternoon. The drive took twice as long as expected, the temperatures were blazing. I believe over 100 degrees and by the time I arrived I was beat. 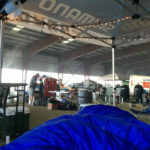 I found Mike and our site and jumped right into the brisket prep as I had to skip the competitors meeting as I still needed to trim my brisket. At this point I feel much better about the trim and what I want to get out of the brisket. 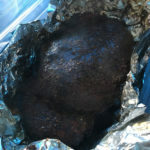 We had yet to turn in burnt ends, and Norco would be our first attempt. To be honest I had no idea up to Norco how or what to do to make burnt ends, so this would be a collaborative effort between Mike and I. 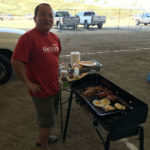 After I finished the trim and prep our team mentor Shuji Sakai begin giving us a tour of the competition site, introducing us to all of his friends. We stopped by Jet Coatings Monkey Style and Monkey himself was kind enough to show me how he trims his brisket. Although I did not change anything with our trim and prep at Norco, this was a great help for me as now I had a good visual of what the finished trim should look like. It was really nice that Monkey would take the time and help a rookie like me. That good deed has not gone unnoticed and I hope to return that favor sometime soon. 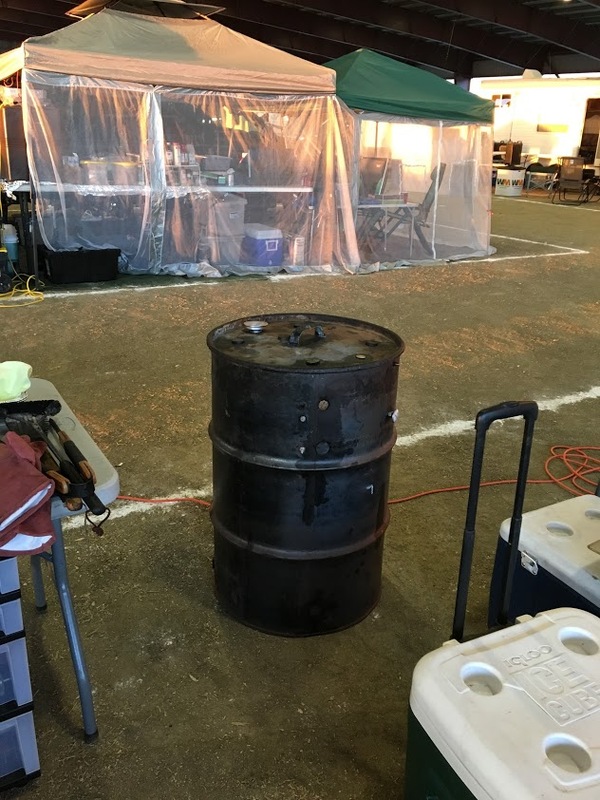 This is the tale of two stories as Norco is when I made the leap from my Vision Kamado to Shuji’s hand me down Ugly Drum Smoker (UDS). Shu’s drum was a great learning experience for me as it taught me how to deal with a very unstable devise and learn to cook good food regardless of its inefficiencies. This drum leaked all over the place, but the more I cooked on it the more comfortable I became and felt like it was a step forward from the Kamado. 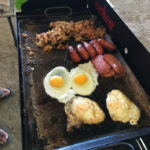 Now don’t get me wrong – I love my Kamado. It’s just not the right device for the way I need to cook. I lit the fire in the middle of the night and threw the brisket on not to long after. The cook went well and I finally feeling comfortable that I actually know when the brisket is ready. I leaned on Mike a bit to confirm when to pull it, we agreed and off the drum it goes to rest for slicing around 1pm. We decided the point was worthy and made our first burnt ends. 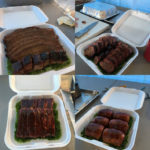 The flat is good and we pulled six great slices, added our burnt ends, boxed it and sent it to the judges. 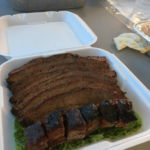 Please keep in mind I am now at my 6th comp and my best brisket score to date is a 161.68 (out of a possible 180 points) which isn’t all that impressive. I feel that I am the weak link of the team and feel pressure to catch up. It’s rough because I feel our brisket scores are holding us back. 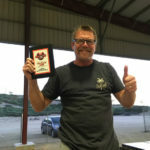 Every comp my scores are low or typically lower than Mike’s and as we chase the CBBQA ROY title, my low scores are not helping us make the top 50% at the first five comps. I am having some confidence issues at this point as I do not know what great competition brisket tastes like or how to make it. I am guessing and leaning on feedback from friends, forums and videos. We feel like we like most comps that are food is solid and it seems that at most comps the judges do not agree. As we listened intently during awards we do not hear our name for chicken, bummer. We get to ribs and we get a call, 7th place! We are elated. We get to pork and more crickets, than brisket and nothing. I knew top ten in brisket was a pipe dream but you have to stay positive. 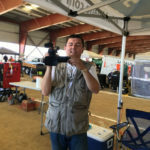 Part of my job is running to the KCBS rep at the end of the awards ceremony to get our scores. We have yet to crack the top 50%, so we are worried we missed it again. I grabbed the sheets and quickly glance at the overall scores hoping to see something good as I headed back to Mike and Shuji. I see we took 15th overall out of 58 teams and fist pump the air. 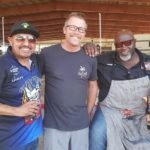 I knew this is a turning point for Rad Fondo BBQ and the brisket assassin Sancho Escobar. 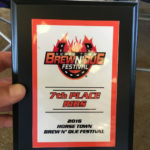 I am so tired of killing briskets, so when I flipped to the brisket page and see we finished 15th with a whopping 172.00 points I was about to lose my mind. That is 10+ points higher than my best score to date. We all high fived, fist pumped, and celebrated a great comp. 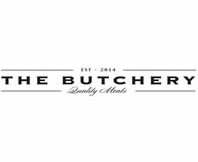 Our food is on the upswing and we began a step forward from the bottom half to the top 50%. With this boost of confidence I now moved forward while still stumbling at times, but continue to see progress all year long. I look forward to Norco in 2017 and hope we get calls in all four meats. Whether that happens or not, I will know we will go there putting our best foot forward with a world of experience behind us. We also got to meet a few more teams and touch base with other teams we have met along the way. Que’d Up, Funtime BBQ, Smokin’ Money with Big Red were all in attendance. A few cold beverages were shared as well. We were lucky enough to score a site next to the ultra-minimalist Nothing Compares 2 Q. 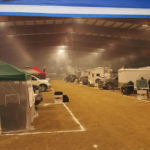 It was awesome to see them pull off and entire comp and arrive in a Jeep Cherokee. All we needed was a little circus music to add to the ambience as they unloaded. 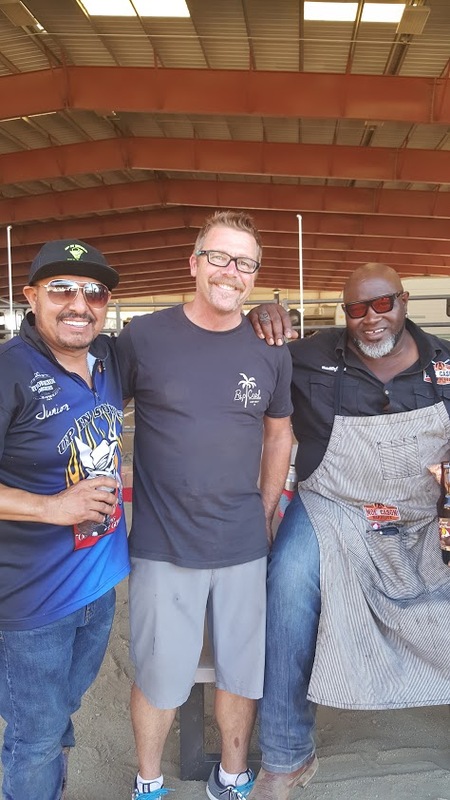 Mike even got to hang out with Junior Urias and Big Moe Cason from BBQ Pitmasters for a bit before awards. For all the brisket cooks wondering what the secret is, the best advice I can give you from my experience is practice, practice, practice and take notes on everything. The only way I worked out of this rut was persistence and a consistent plan. I am far from a champion brisket cook, but it is my aspiration and that drive will continue to make me better. Here’s to cooking hot and fast, drum smokers and chasing the elusive 180.